In group's of 3, we can create triangles, within a square that has four sides. The immediate 2 sides of the ball must be supported by teammates to create width. E.g. #3 & #4 support #2 on either side of the ball. Force the defender into making a decision. Attacking players keep possession for as long as possible. Defenders must win possession back & play into teammates in the opposite half of the field. It's more realistic to a game & transferable from the practice field because you adjust from attack to defend & back to attack. If the ball is kicked out by the defender at any time, then the attacking team receives possession back. Just like a throw in. 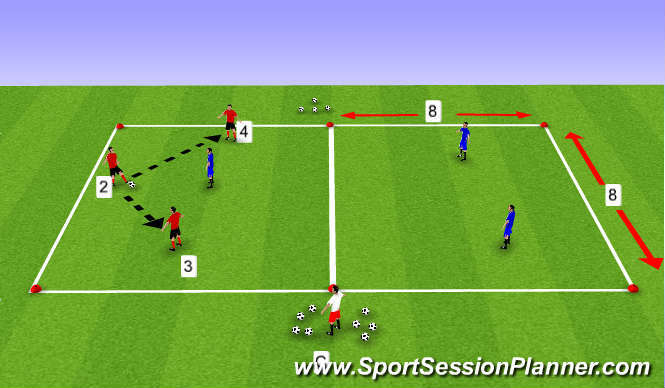 If the attackers kick it out the defending team in the opposite half receive possession from the coach. The player who loses possession must become the defender in the opposite half. The purpose of the supporting players' is to get into a good position. 'A good position is where they can receive the ball at their feet without it being intercepted.' Players need to move. E.g. #3 is in a good position of support. #4 is in a better position because s/he can receive the ball without it being intercepted, but, s/he is playing off the shoulder of the defender forcing him/her to make a decision to pressure #2 or drop off to mark space & #4. A good position is to force the defender to think and make a decision. 20 x 10yd Area divided in two grids of 10 x 10yd. 6 players minimum.